I recently judged communication campaigns and tactics, and was struck by the lack of planning involved in nearly every entry. Particularly absent was the lack of specific communications objectives. If you’re in public relations, marketing or corporate communications, you need to know how to craft a solid strategic communication objective because that is the single most important focal point of any communications campaign. If you don’t know what you’re aiming for, you’ll never know if you reached it. Below are components of a communication objective, but ultimately, you’ll want to ensure this is part of a strategic communication plan that aligns with your organizational or departmental business objectives. Expect your outcome. Are you trying to raise awareness of a new widget or new process? Or do you need to move the needle by changing employee or customer attitudes? Perhaps you need a target audience to adopt a specific behavior. Before you can craft an objective, know what you expect the outcome to look like. Use verbs! Once you know the expected outcome of your objective, select an appropriate verb. Do you want customers to buy, ban or endorse? Are you looking for employees to adopt, support or change? Be specific. I can’t tell you how many times I’ve looked at communications plans that aren’t tied to specific objectives. 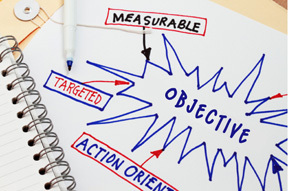 If you can’t articulate the objective specifically, then you are already missing the goal. What is the attainment level? Measure the objective. Know how to accurately measure your objective, and know your baseline. This is your starting point. What is the current status quo? You need to know this before you initiate your strategy; otherwise, you won’t know whether you moved the needle or not. Within the next 60 days, 70 percent of our organization’s customers will see or hear about our new widget. Starting with these basics, you’ll add a solid, measurable component to your strategic planning. What other components help you achieve your goals?